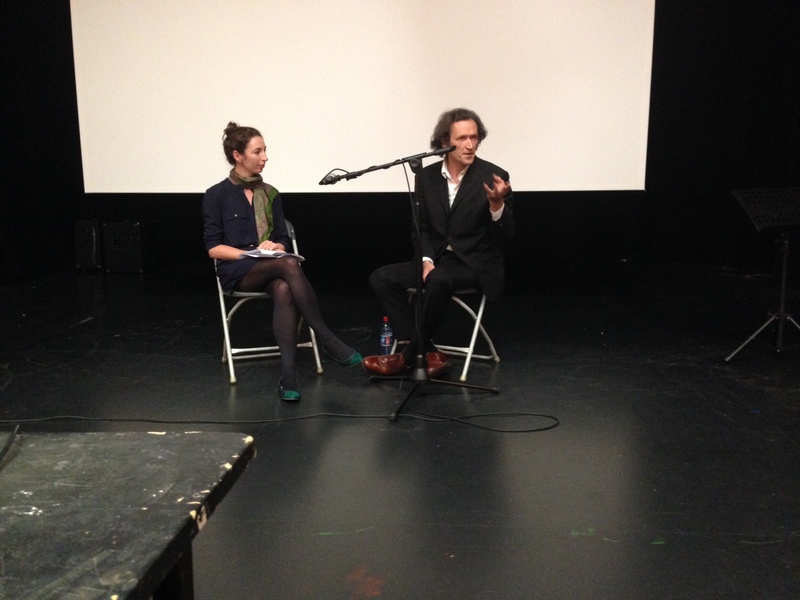 Artist Denis Buckley in conversation with Future State’s Stephanie Feeney. Image courtesy of Ruth Annett. Spatial politics was on the programme long before a panel of speakers was drawn together under the same title. To not talk about spatial politics would have been to ignore the peripatetic nature of LAND │LABOUR │CAPITAL as it, and its participants, crossed over and back between the host gallery, Limerick City Gallery of Art (LCGA), and two contested spaces: 69 O’Connell Street; Occupy Space. Financial uncertainty means that 69 O’ Connell Street, formerly the Belltable Arts Centre, no longer runs as the city’s multi-functional space for dance, theatre, visual arts and music that it was intended to be, despite the high spec. interior and impressive technical facilities. Occupy Space (no relation to the Occupy movement), an artist run space, had itself existed as an itinerant organisation for a considerable time due to irregular support from funding partners. Indeed LAND │LABOUR │CAPITAL was one of the first events in Occupy Space’s new, permanent, home on Cecil Street. In fact the entire Georgian Quarter of Limerick is contested, punctuated by empty buildings, like the ironically title The Bank public house, and multi-coloured ‘To Let’ signs. It felt appropriate that LAND │LABOUR │CAPITAL was part of the politics too. Spatial politics and contested spaces exist everywhere, not just in Limerick. Lukáš Matoška, a philosophy student at FFUK Charles University in Prague, reflected on the many appropriations of Hotel Praha in Prague, a monument of the Czechoslovakian era and a state socialist regime. Hotel Praha has had a varied past: used for accommodating state VIPs during the socialist era; privatised and operated as a private hotel after the fall of the Iron Curtain; more recently, purchased by a private financial group that intends to demolish it and build a private school. Matoška likened the planned demolition to a tool for the ruling classes to erase traces of a former regime, one which it supposes has already been erased from the collective memory. Public protests and demonstrations in Prague show that this is not true. The demolition of Hotel Praha is a violent, neo-liberalist, re-mapping of psychogeographical space. Dr Angela Dimitrakaki in conversation with Future State’s Stephanie Feeney. Image courtesy of Paul Tarpey. So when the question of whether the artist is the embodiment of the neoliberal worker was asked by Dr Judith Stewart, herself an artist and Independent Researcher, there was a moment of rupture. 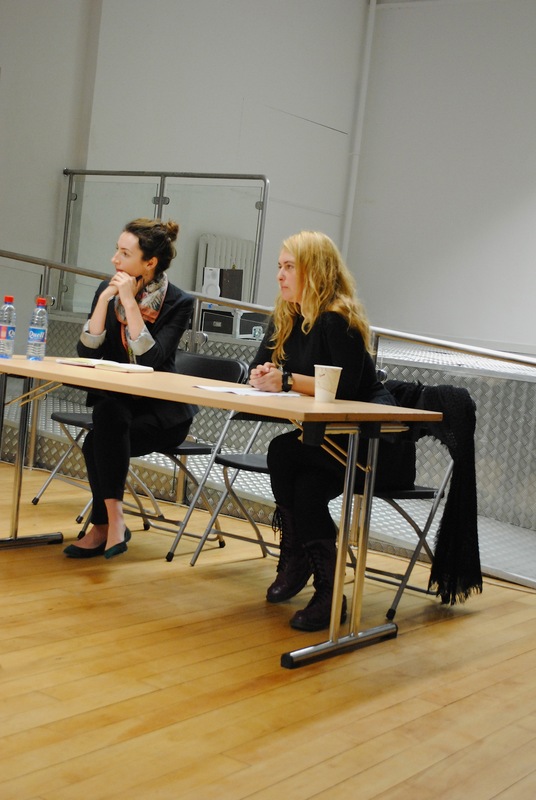 Stewart questioned whether socially engaged art, a form of art production that seemed particularly pervasive in Limerick, is an ethical process of art production and the complicity of artists in maintaining a flawed and unfair system. Stewart cited examples of artists engaged to work on social projects who are expected to bring about change within unrealistic time frames and little or no budget. By continuing to accept conditions of low pay, long hours and unrealistic outcomes, precarious working conditions for artists become performative and iterative. Keynote speaker Dr Angela Dimitrakaki, Curator and Senior Lecturer in Contemporary Art History and Theory at University of Edinburgh, echoed Stewart’s words. In her paper she pointed out the irony and contradictions in being repeatedly told that cultural work is valuable and important yet there is no funding to support it. The cultural worker goes unpaid and works late into the night. This is why, Dimitrakaki argued, that the art work as object or output must be separated from the process of the production of art. It is important to realise, she argued, the more successful the artist, the more access the artist has to autonomy. The successful artist establishes a studio, employs artist assistants to support production of the art, has access to a superior infrastructure and is in a better position to produce better work. Image courtesy of Paul Tarpey. From artist as labourer to an artist whose research engages closely with themes of labour and land, Dr Deirdre O’Mahony described her art practice as a ‘right to speak’. O’Mahony, who teaches at the Centre for Creative Practice at Galway-Mayo Institute of Technology, was one of the contributing artists to Labour and Lockout, a group exhibition running at the LCGA simultaneous to the conference. O’Mahony’s installation, titled T.U.R.F. (Transitional Undertandings of Rural Features) featured archival material and art objects that drew attention to the conflict between the social and the natural landscape or, more specifically, the conflict between the use of rural landscape for leisure and livelihood. The ‘right to speak’ that her practice affords her is necessary, O’Mahony states, in the face of DAD (Decide, Announce, Defend) tactics employed by top down power structures against rural communities. She cites examples of the closure of rural post offices without due attention to the social impact on the rural community and unfair, if not illegal, processes for implementing EU Directives against farmers that impact livelihoods and long standing cultural traditions. The appropriation of cultural activities to re-present (alternative) narratives makes a difference, she urged, not least because one European policy maker described it as ‘qualitative research’ and something of which policy makers need much more. O’Mahony went on to facilitate a T.U. R. F. Mind Meitheal, a part of her practice which creates a cultural space to examine, in this case, the effect of the implementation of the EU Habitats Directive on domestic turf cutters and their families. Mind Meitheal was something that Professor Nicholas Mirzoeff had in mind when he urged us create a ‘commons’. Mirzoeff, Professor of Media, Culture and Communication at New York University Steinhardt and cultural theorist, has been closely involved in the global social movements that have arisen since 2011, in particular what we now know as the Occupy movement associated with the “We are the 99%” slogan, writing a daily observation of the movement’s development in 2012. Resonance, Mirzoeff urged, is the means by which social change spreads and resonance can come about when a commons is created. O’Mahony spoke of the ‘right to speak’, Mirzoeff talked of ‘the right to look’. A commons is created when we look at one another, acknowledge one another, show love. Commons, followed by resonance, comes into being at interstitial points: collaborate; network globally; visualise (he cites Visualizing Palestine as a strong example). 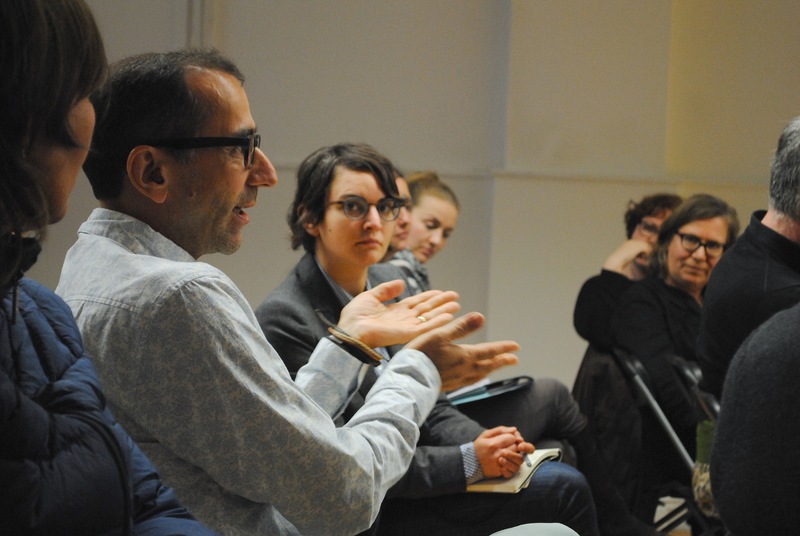 Mirzoeff describes himself as a militant researcher, an activist academic, an academic who not only comments on activism but engages in it directly. The research he engages with is not simply about the activist causes, but designed to strengthen the cause further. The recently available Militant Research Handbook that Mirzoeff co-produced is an invitation to its readers to engage in militant research in a way that fits. It urges vision, re-imagining new spaces, changes from the ground up and optimism. 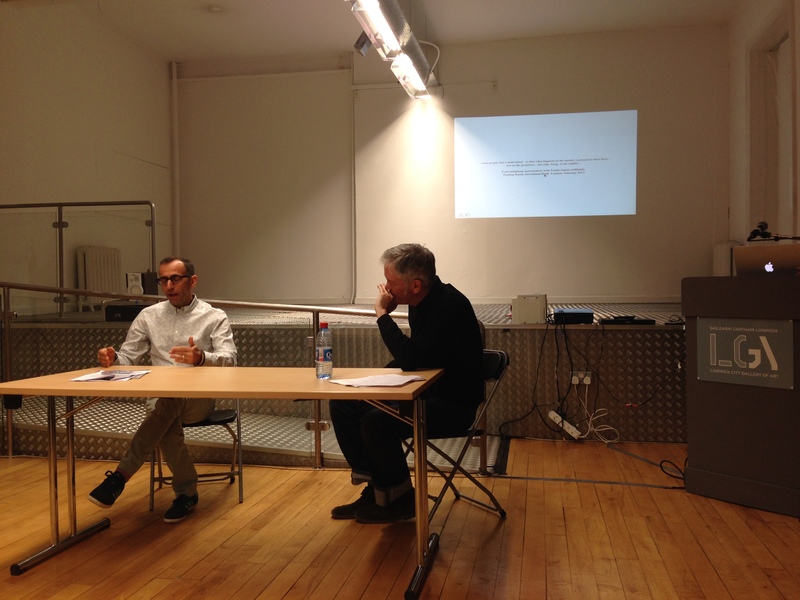 Professor Nicholas Mirzoeff in discussion with Dr Mark Curran Image courtesy of Ruth Annett. Curran claims that the market is constructed and there is widespread complicity in creating and maintaining the construct. He pointed to more than one image of members of the Irish government photographed in global stock exchanges ringing the exchange bell to signify the opening of that day’s trading, even at a time when Ireland was itself out of the market because of the International Monetary Fund (IMF) and EU bailout, but still desperate, it seemed, to create the impression of normality. In his research and art objects he makes visible and audible the hidden functionality of the global markets so that it can be observed and explored. One hidden functionality is algorithms, employed in algorithmic/high frequency/black-box trading practices that replace human decision making and risk taking in market trading. The algorithms are capable of experiencing and self-evolving, which, it has already been warned could, over time, give rise to ‘normalisation of deviance’. Curran reported alarming statistics in the growth of algorithmic trading that now account for as much as 80% of market trading in the US. Curran, along with Ken Curran, designed an algorithm to identify how often the Irish Minister of Finance used the words ’market’ or ’markets‘ in public speeches since taking office in March 2011. The algorithm’s output is manipulated into visual and aural forms and makes up part of THE MARKET installation. The extent and depth of Curran’s knowledge was impressive and he confirmed that he continues to work on THE MARKET, buoyed by what he senses is a thirst from the general public to understand more. There was more, much more than what has been mentioned here. Justice cannot be done to all of the rich discourse that evolved over three days, framed in the issues raised by Allan Sekula and Noel Burch’s The Forgotten Space (2010), which was screened on the opening night: precarious labour, capital and information flows, global resources, global citizenship, exploitation, borders, art and visuality, activism. LAND │LABOUR │CAPITAL was rich, stimulating, invigorating, profoundly affecting, optimistic and collaborative and, without doubt, a formative milestone in Future State’s existence. Recordings of the event will be added to this website soon.